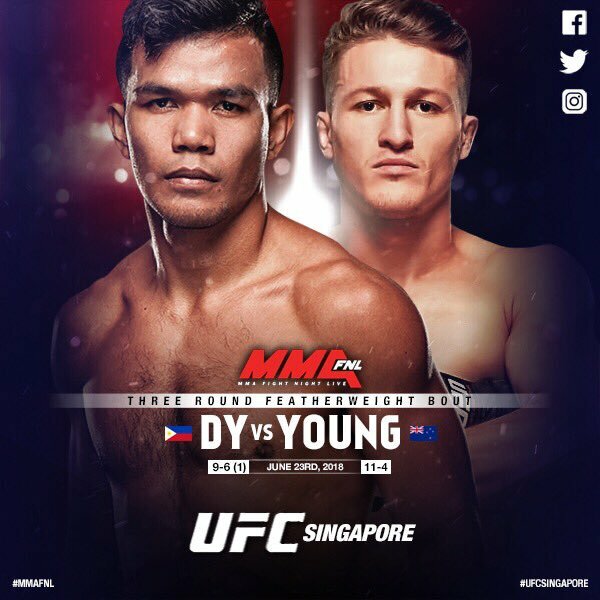 Filipino UFC Fighter Rolando Dy faces Shane Young of New Zealand on June 23, 2018 in the undercard of UFC Fight Night 132: Cowboy vs. Edwards. This fight will be held at Singapore Indoor Stadium, Singapore. Rolando Dy is coming off a unanimous decision victory over Wuliji Buren in UFC Fight Night 122: Bisping vs. Gastelum. Dy has a record of 1W-2L in the promotion and now trying to make his luck by gaining another victory in this upcoming fight. Meanwhile Shane Young, will fight in the UFC for the 2nd time, he was defeated in his last fight against Alexander Volkanovski but the 24 years old fighter still wants get a big W in the best MMA promotion in the world. Results: Shane Young knocks out Rolando Dy in the 2nd round.